Dow Jones went down 48 points after rallying 2.4% last week. With little on the economic calendar Monday, the Dow Jones eased 48 points after September rally of 8.4% and 2.4% last week as worries about the financial sector offset excitement over a fresh round of corporate deal-making announced by Southwest Airlines, Wal-Mart and Unilever. Corp., one of Europe's more troubled banks in recent months. Global banking giants like Barclays PLC and JPMorgan Chase & Co. each fell more than 1%. For Dow Jones, key economic data will be watched for further clues on whether the economic recovery is still on track and if the market's recent rally is justified. Major announcements are September consumer confidence (28 September), August’s consumer spending (1 October) and ISM index (1 October). With positive technical readings after breaching the 3 months high of 10720, higher resistance targets are at 10920 (May 12’s high) and Year-to-date high of 11258 (April 26). Immediate supports are situated around 10500-10600 points. 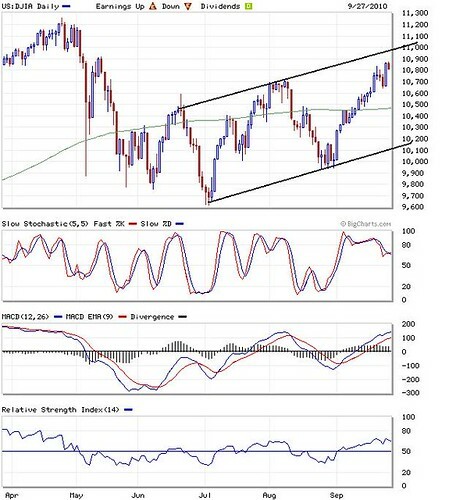 Daily Dow Jones shows immediate resistance target at 11000 points.